Concordat Watch - Concordat Strategy | What are Concordats? 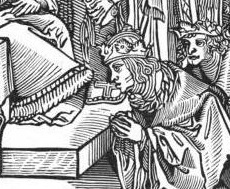 A 16th c king kneels to kiss the pope’s foot, acknowledging the Church’s claim to be superior to the state. The Catholic Encyclopedia (1908) says that a concordat cannot be an international treaty, as it is not between equals. Therefore a concordat binds the state, but not the Church. Only later, to give it legal precedence, did the Vatican style it a “human rights treaty”. A concordat is an agreement between the Vatican and a foreign state. These agreements give privileges to the Church, but generally offer few advantages to the state, though they are often politically useful for the rulers. Concordat privileges are so tempting that other churches, large and small, now clamour for equivalent “church-state treaties”. These include the Lutheran Church in Germany and the Orthodox Church in Belarus, Armenia and Georgia and even the Seventh Day Adventists in the Czech Republic. As a Catholic theologian says, “the Catholic Church has opened the way for all religious communities to enjoy the same rights”. By sharing the spoils, this delivers a fundamental blow to separation of church and state. The Vatican's foreign minister has claimed that the aim of concordats is “to protect the freedom of the Church in a country, and the right of individual faithful and citizens to religious freedom.” For this, however, concordats are not necessary. There are three proven ways to guarantee religious freedom, none of which involve concordats. These are through domestic legislation, through a country’s constitution and through its human rights agreements with international bodies like the United Nations and the European Union. In fact, religious freedom hardly seems to be correlated with concordats. Countries without concordats include Northern Europe and the English-speaking world, while countries with concordats included almost all the Fascist states of the 1920s to the 1940s. If anything, the correlation between concordats and religious freedom looks like a negative one. Originally concordats were agreements between two monarchs: the pope who ruled the Papal States and the ruler of the other country. John Paul II was able to make such an agreement with King Hassan II of Morocco in 1983-1984. In such cases there is no parliament to complicate matters. Today, however, with both absolute monarchs and dictators hard to come by, concluding a concordat is not so easy: the pope is the only remaining absolute ruler in Europe. This has obliged the Vatican to develop many ways of getting concordats approved by sceptical parliamentarians. Sometimes the text of the concordat may be kept secret until it has been signed which prevents any discussion of its terms by parliament or the public. By the time the legislators and the public find out what the concordat says, it can no longer be altered, only approved or rejected as a whole. And sometimes parliament is even expected to vote on this complex ― and permanent ― legal document too quickly for any real scrutiny. If that doesn't work a concordat may sit unratified for years until the political climate allows it to be ratified and cast in stone. For more on this, see Twenty tricks to get a concordat through. By hook or by crook the Church tries to get itself concordats. These allow the Church to extend its privileges, including massive state subsidies, even as, in many countries, its membership is decreasing ― and it also locks these payments in. This is why in the 1990s the Slovak government wanted to introduce a “church tax” (a fixed percentage of the income tax paid by church members), whereas the Church insisted on maintaining the status quo, (an annual donation according to present “needs”). If the Church succeeds in getting “present need” funding enshrined in the future concordat on finances (to which it is bound by art. 20), there will be no realistic possibility of reducing the state contribution ― ever. A concordat does three things. ♦ First, it installs a ratchet. The concordat itself cements previously-granted privileges and adds new ones. And the ratchet effect doesn’t end there, for a “general concordat” may be used to sets up the framework for more detailed ones to come. The general concordat acts as the thin edge of the wedge: its terms are vague enough to make it easy to get through parliament, but if the parliamentarians later balk at the more detailed concordats, they are told that they have already agreed to them in principle. And if the general concordat has included an "aim" to conclude them within a certain time, this can be used to apply more pressure, by presenting it to the media as a “promise”. A framework concordat is like a Russian doll containing more. ♦ Second, and even more ominously, because a concordat claims the status of international law, it prevents Church privileges, including massive state subsidies, from ever again being brought under democratic control. ♦ And third, a concordat stipulates that “Church institutions” are governed by Canon Law (the law of the Catholic Church). However, since the Church is permitted to run various social services ― with state support, of course ― the laws which govern these Church institutions also affect those who work and those who are served by them. This legal manoeuvre means that a concordat can set up a theological fiefdom where certain human rights do not apply ― and where they can never be reintroduced without the consent of the Church. By means of concordats Vatican diplomats and lawyers are mounting an attack on many of the freedoms that we have won since then ― rights that we had come to think were unassailable. The Vatican’s concordats pose an increasing threat to both democracy and human rights. 1. "The Vatican’s triple crown: church, government and country", Concordat Watch. 4. Jean-Louis Pierre Cardinal Tauran, speech before a French bishops’ conference in Lourdes, 5 November 2003. Translated excerpts available at "Vatican Foreign Ministers on concordats: Tauran (1990-2003)".